The extensor digitorum muscle extends your fingers. 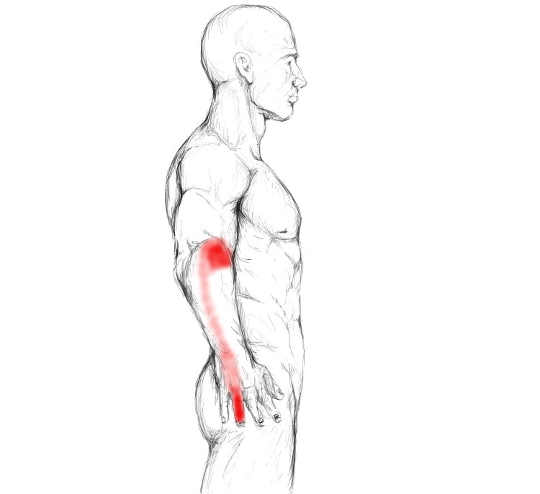 If it gets too tight or develops trigger points, you can feel pain at your forearm and elbow. People that suffer from problems in this muscle are usually involved in work that requires lots of finger and hand activity – e.g. musicians and craftsmen –. Fortunately, with the right tools those issues can be fixed pretty quick. Self-massage is a brilliant option and more accessible than most people imagine. On this page you will learn about this muscles’ insertions, functions, pain zones, overload movements and impaired movements. Furthermore I will guide you through the palpation and self-massage of this muscle. If this muscle contains trigger points, it can send pain down your entire forearm, to the back of your hand and your 3rd – 4th finger. Furthermore your finger joints might feel sore if it is overworked. Additionally, it is possible that you experience pain at the lateral epicondyle of your humerus, which often feels like a tennis elbow ache. Last but not least, this muscle can send pain to the inner side of your wrist right below your thumb – not shown in the picture –. The deeper the red in the pictures displayed below, the more common it is to experience pain in the corresponding area if this muscle harbors trigger points. Of course, all activities that caused this muscle to tighten up or created trigger points in the first place, will be painful if performed. Beside that, with a troubling extensor digitorum muscle you might have pain when shaking someones hand or grabbing objects – e.g. box of water, cup of coffee –. In more severe cases, you even might experience a weak grip accompanied with pain while opening and closing your hand. As you use your fingers almost all the time during activities of daily living, this muscle has the power to massively influence your quality of life if it is overworked. The extensor digitorum muscle runs from the lateral epicondyle of the humerus down the entire length of the forearm and splits at the wrist into 4 tendons that run to the 2nd – 5th finger. 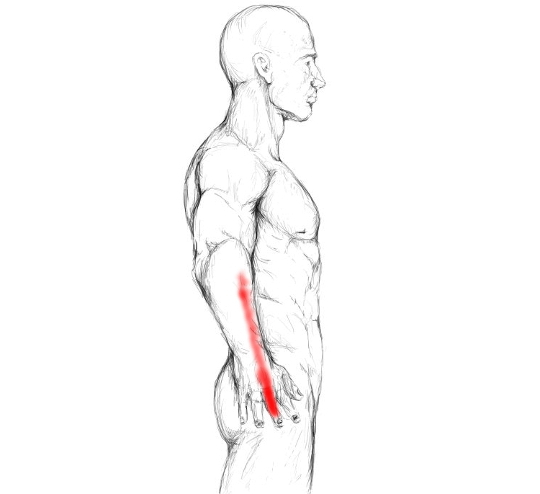 The Xs in the picture below display common areas of trigger points that can develop in this muscle. This muscles’ main function is the extension of your 2nd – 5th finger and the support of the extension of your wrist. Furthermore it enables you to move your fingers inter-independently and to spread them apart. Last but not least, like all forearm extensors, it helps to stabilize your wrist during gripping motions. The stronger the grip, the stronger this muscles gets activated. 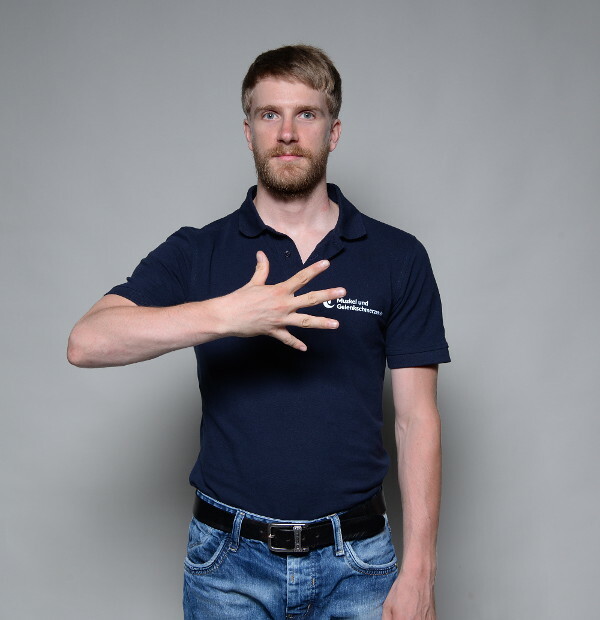 Excessive muscle tension and trigger points can develop in the extensor digitorum muscle especially with repetitive finger movements and strong grips. This means it leaves everyone that uses his or her fingers a lot with a high chance of developing a painful hand, forearm or a tennis elbow if those activities are not balanced – e.g. by stretching, massage, relaxation exercises –. Among others, the following activities can be causes for a troubling extensor digitorum muscle. Feeling this muscle is easy. 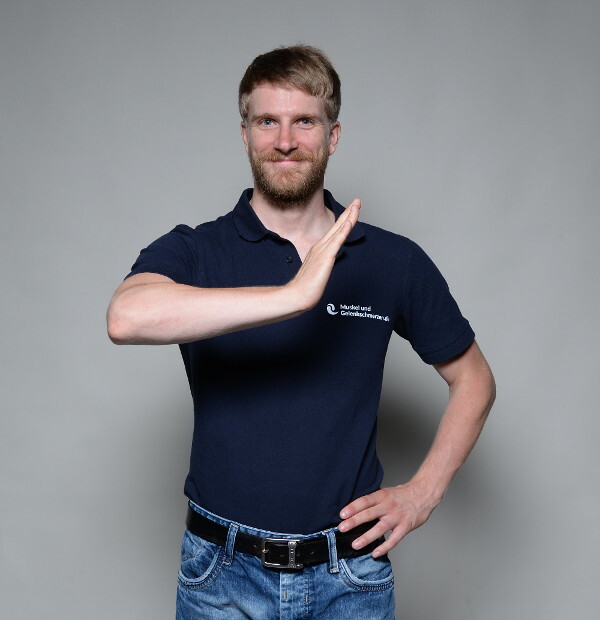 Place your fingers on the lateral epicondyle of your upper arm and then move your fingers. While doing so, travel down your forearm and feel the extensor digitorum that is contracting with that movement. For massage I recommend using either your fingers or a massage ball against a wall. Place the ball on your extensor digitorum muscle and slightly press against a wall. Now start to roll over your muscle and search for tender spots. As soon as you find one, stay there and massage it for about 10 – 15 times with very slow and precise strokes. Then move on to the next tender spot or the next muscle on your to do list. Place your fingertips on the muscle and search for tender spots. As soon as you find one, massage it with very slow and deep strokes for 10 – 15 times. Then, move on to the next tender spot or the next muscle. It is important to focus on the painful spot instead of just rubbing around the whole muscle. Keep the following in mind: Only precise massage does the job! Alternatively, you can just press your fingertips “into” the muscle and then moving your fingers for about 10 – 15 times. Note: If you use your fingers for massage, make sure to take frequent rests and/or to keep your massage sessions short – 2 to 3 tender spots –. Otherwise you are at a higher risk of straining them.